The University of Manchester has been awarded a grant from Dementia Platform UK to install a new dementia-friendly PET-MR Scanner at Central Manchester University Hospitals NHS Trust to further research into the condition. The facility is the first of its kind in the North West of England. 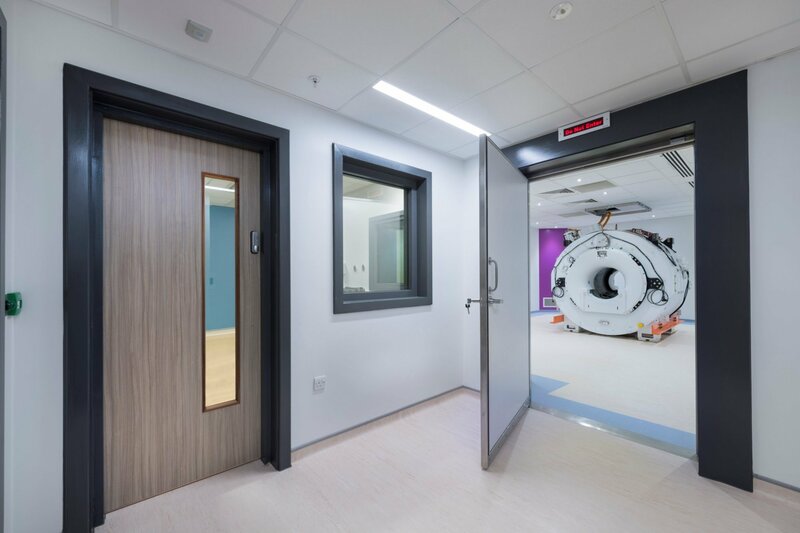 Nicorna Healthcare was commissioned to design the designated scanner suite in a shelled area of the existing trust estate adjacent to the Nuclear Medicine Department. 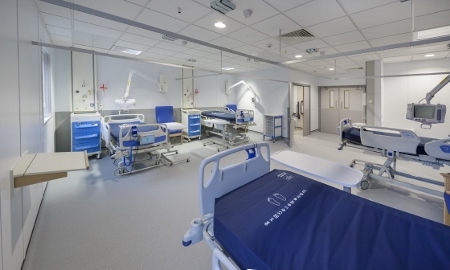 Accommodation included: a designated PET-MR scanner room, a control room, a scanner equipment room, radiopharmacy, bespoke treatment rooms, a research office, consulting Room, WCs, stores, and a patient waiting area. All aspects of the design were carried out to comply with dementia guidelines including the inclusion of plain-patterned flooring with contrasting borders sweeping into patient areas to assist with wayfinding; full-height contrasting wall edge protection to fully accentuate changes in direction; individually-colour-coded treatment rooms with coloured bands around doors matching feature walls for each room; and door leading edges and vision panel glazing beads highlighted in contrasting wood veneer to enhance visual awareness. Due to the existing location and the weight of the scanner (eight tonnes) it was necessary to increase the bearing capacity of the structural slab. The contractor carried this out by removing the existing slab by cutting it into manageable cubes and lifting out via suction to electric dumpers. This alleviated noise and vibration to ophthalmic operating theatres above. Both PET and MRI scanners require specific shielding requirements, and having both modalities in the same machine created challenges to ensure the magnetic resonance and interference, and also the radiation emissions, were contained. A traditional copper RF (Faraday) cage was installed along with steel shielding incorporated into the knock-out panel to the rear of the scanner, and the entire perimeter of the scanner room was enclosed in 200/300mm-thick dense aggregrate blockwork with all penetrations shrouded in lead sleeves to combat scatter radiation from the machine and patient. Treatment rooms were also constructed in DA blockwork. Due to the substantial weight of the blocks,a platform was erected at mid level to enable safe handling and working. Works commenced on site in May last year. The university has since been commissioning the machine and the suite was officially opened on 8 June.